Are you wanting to eat clean and start focusing on Whole30 recipes? Many people like to utilize their electric pressure cooker when preparing these recipes. This Instant Pot Whole30 Chicken Soup is so filling and packed full of flavor. This is a great list to add to your Whole30 meal prep grocery list. Let me show you just how easy this soup is to make. Make sure you check out all of our Instant Pot recipes while you’re here. Grab your Instant Pot and put the insert into the pot. Set it to sauté. Add the ghee, garlic and onion to the pot. Simmer until the onions are transparent. Add the chicken to the pot. You can use frozen chicken, just ensure it is defrosted. Stir to combine the chicken in with with the garlic and onion and ghee. Let it brown for about 2-3 minutes on each side of the chicken thigh. Add in your celery, carrots and potatoes. Add in the seasonings, including the salt and pepper. Pour the chicken broth over top. 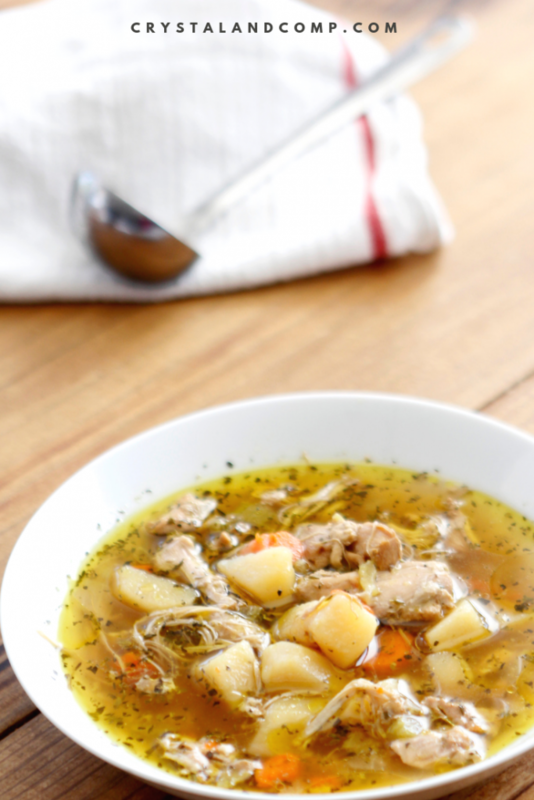 I use Orrington Farms chicken broth base. We love it! Pop the lid on the pressure cooker. Put it on high pressure for 30 minutes. Ensure the valve is sealed. When it is done cooking you can do quick release. Once it is done ladle it up into bowls and serve. Everyone in my house loves this. Check out more of our Whole30 Instant Pot Recipes! Could you Make this in the Slow Cooker? Yes. You absolutely can. If you do, omit the ghee and the browning/sauté steps and toss it all in the slow cooker on high for 6 hours or on low for 8-10 hours. If you are using a programmable slow cooker it will automatically move to warm once the cook time is up. This is super helpful and handy. Or, use the slow cooker feature on your Instant Pot. If you do this you can still follow the ghee saute steps since you will already be using the same pot to saute and slow cook. 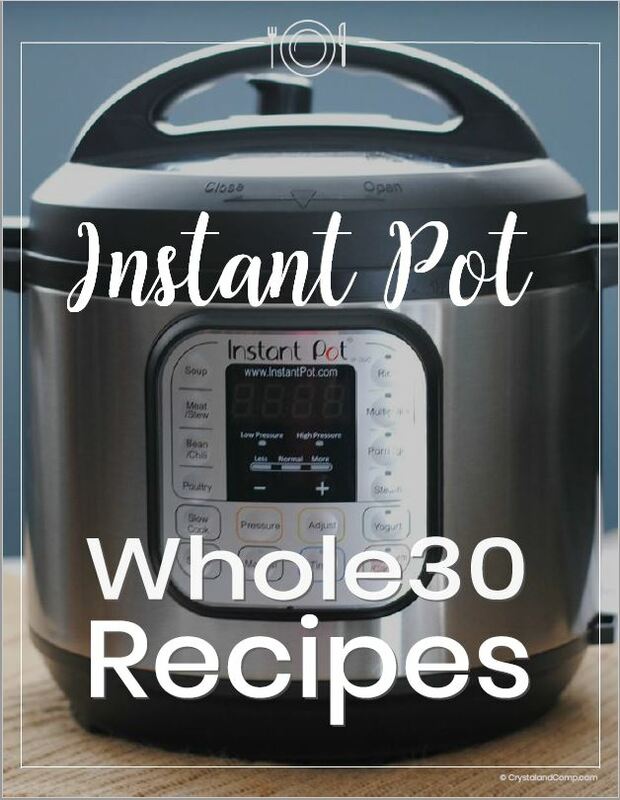 Why Use an Instant Pot with Whole30? An Instant Pot allows you to dump and go and the food cooks fast! Utilizing your electric pressure cooker allows us experience success with cooking dinner which will encourage us to keep cooking dinner each night for our family. Because we are a large family, I use an 8 quart Instant Pot. This is perfect for our family of 8, but at any given time we will have 10 to even 12 people eating dinner at our house. A 6 qt electric pressure cooker is perfect for a family of six or under. Whole30 is a 30-day way of eating that focuses on whole clean foods and gets rid of sugars beans, grains, soy and dairy. Whole30 is similar to Paleo. When being 100% complaint, Whole30 prevents you from using natural sweeteners like honey and maple syrup. Instead, you would use natural clean things like date paste, for example. The idea is Whole30 helps you cut out the foods that might be causing you issues. Ideally, with Whole30 you can see what foods are triggers for your body. Here is a basic and quick list of what you cannot have on Whole30 when trying to be complaint. Here is a quick basic list of the foods you can have when you’re doing the Whole30 diet. Ghee is clarified butter that is made from cow milk. During the clarification process they remove most of the milk protein which is why it is Whole30 compliant. As you can see Whole30 is lots of natural eating and eating things that are from the ground and not processed. Clean eating. If you’re looking for more clean eating Instant Pot recipes just like this one, grab our Whole30 Instant Pot cookbook. It is an instant download so you can start cooking right away. It includes this recipe plus 21 more!